Sources said Ocean was in 'advanced talks' to acquire the OOH company. Exterion Media's private-equity owner was close to selling to Ocean Outdoor before it agreed to sell to Global. Multiple industry sources said that Ocean was already in advanced talks to buy Exterion from Platinum Equity before Global made its binding offer for the out-of-home company. It is understood that Global swooped in to buy Exterion during negotiations that lasted only a matter of "days" last week. Industry sources believe Global paid between £450m and £500m for Exterion, the operator of Transport for London’s Tube contract. It is thought that Ocean was not willing to pay as much as Global. Observers said Global, which is owned by the Tabor family, may have been able to act more quickly than Ocean, which is in the middle of a plan to list on the London stock market in the autumn. Ocean would not comment on any aspect of the Exterion sale or say if it was involved. However, Ocean, which was bought by Ocelot Partners earlier this year, previously told investors that it wanted to make acquisitions. Global’s binding offer to buy Exterion follows its double acquisition of Primesight and Outdoor Plus three weeks earlier, giving Britain’s biggest radio group close to 35% of the UK OOH market and putting it close behind market leader JCDecaux. Tim Bleakley, chief executive of Ocean, welcomed Global’s decision to invest in the OOH sector without commenting on any of the deals. "It’s an audacious move by Global," he said. "Hats off to them. Welcome to the great outdoors." Global is estimated to have spent more than £700m on its investments in OOH, including the £450m-plus on Ocean. The company is believed to have spent close to £300m on Primesight and Outdoor Plus, including debt. The group will more than double in size with turnover approaching £800m, according to Companies House filings. Global had £303m in turnover, while Primesight and Outdoor Plus had combined sales of £92m last year. DoublePlay I, the main UK-based holding company for Exterion’s assets, had sales of £373m in 2017. About two-thirds, or around £230m, is said to have come from the UK, with the remainder from overseas. It means that the enlarged Global's combined UK ad sales should be nearly £600m, making it about sixth behind Google, ITV, Facebook, Channel 4 and Sky. Global announced the Exterion deal at 6pm on Friday to widespread surprise. 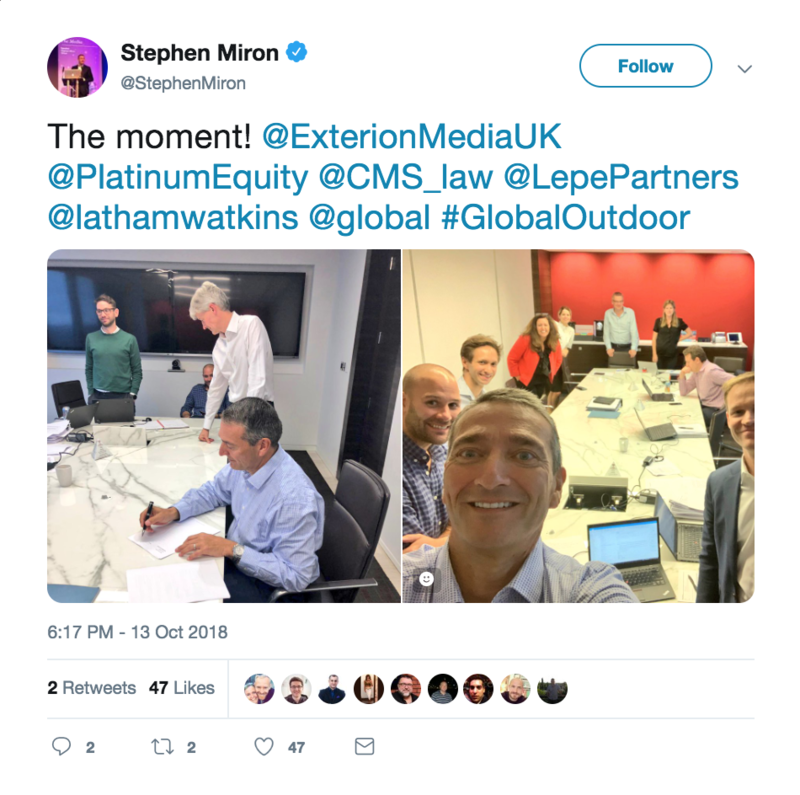 Stephen Miron, group chief executive of Global, posted photographs on social media of what he described as "the moment" when the deal was done and name-checked the banks and law firms involved. Global’s offer for Exterion needs the approval of a French workers’ council. UK competition regulators could also examine Global’s planned purchase because of its size, although industry insiders suggested they did not think that it would pose a significant obstacle. One source pointed out that TfL, rather than Exterion, owns the London Underground assets, which regularly come up for review. Platinum Equity bought Exterion, then known as CBS Outdoor, for $225m (or about £140m at the time) in 2013. 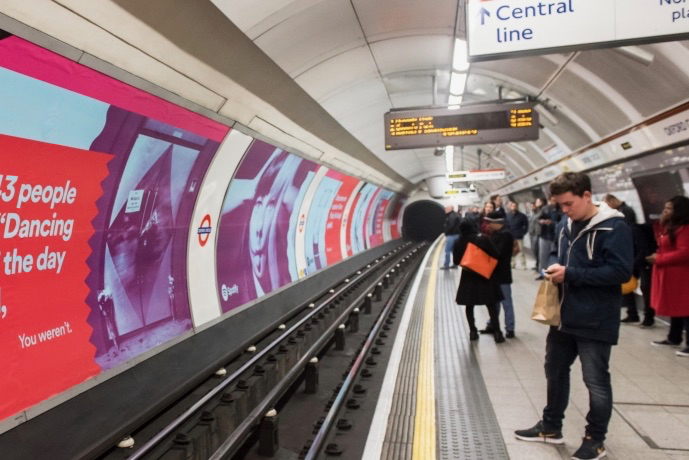 The private-equity firm has been weighing its options for the past two-and-a-half years, ever since Exterion retained the expanded TfL contract in March 2016. Exterion considered a UK stock market float but dropped the idea after the Brexit vote in June 2016 and the financial markets soured. Global and Exterion would not comment on the sale process; Platinum Equity did not immediately respond to a request for comment.